Traditional Bowhunters of Washington is a non-profit organization established in 1990. It’s purposes are to promote the use of traditional equipment for bowhunting and archery, encourage and provide instruction for the making of traditional equipment for and by the individual archer, and make our views known on the advancement of modern archery equipment and the image of bowhunting as a close range, primitive weapon sport. We are husbands, wives, friends, neighbors and kids that have a common passion. We believe in the romance of bowhunting with traditional archery equipment, and adhere to and believe in the rules of fair chase as set down by the Pope & Young Club. We appreciate the beauty of handcrafted bows, arrows and archery tackle. Members of the TBW community enjoy the thrill of crafting self-made archery equipment and are excited by experiencing traditional archery with bare longbows or recurves. Annual TBW rendezvous: This is a fun shoot. TBW members gather together solely for the purpose of fellowship, shooting and making traditional equipment. Annual Washington State Jamboree (WAJAM) – This events is geared towards teaching TBW members of all ages the art of bow building and flint knapping. Partner in the Western States Rendezvous: This event is held each Memorial Day weekend. This shoot bring together many archery communities from several states. Hosting of the event rotates throughout clubs in the Northwestern states. There are a number of 3D shoots each year. These events welcome you to shoot until your arm falls off and just have fun. We proudly sponsor, help organize, and volunteer to teach archery to campers at the Northwest Burn Foundation’s Annual Summer Camp for Kids. TBW maintains a presence at the information booth for outdoors sports shows. We have an annual membership meeting at the annual rendezvous. There are typcially 4 board member meetings through the year, but all members are welcome to attend TB Board meetings or to contact board members at any time. We have an annual TBW Banquet & Auction to support the club. We publish the “Toxophilite” newsletter. This is a newsletter which is sent to all members with club news and various archery related information. See the events calendar for a complete list of events and dates. Join Other Traditional Bowhunters and Archers! The Traditional Bowhunters of Washington are dedicated to the values and practices of traditional archery. We believe in the Rules of Fair Chase and the sole use of traditional equipment in the pursuit of wild game. We believe that the practices of traditional handiwork – bowmaking, arrow making, and all other associated crafts of toxophily – promote the enduring value of archery. 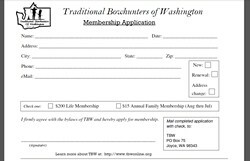 TBW membership runs from August through July each year. A TBW lifetime membership is just $200, one time only, and annual memberships are a low $15 per year. Membership dues can be paid by check, just click on the application below and send it to the address listed.